I am often asked questions about fish nutrition and live foods for the reef aquarium, so I wanted to try to write a general overview article on the subject. Therefore, instead of giving you a list of recommended foods to feed your fish, I have decided to take a more general approach and talk about all the different options for feeding a living miniature reef aquarium. The main reason for me doing this is that although fish are certainly an interesting an integral part of many reef tanks, there are a whole suite of other animals that require food as well. Many of the foods that are most important to a reef aquarium are rarely discussed, and are quite often inappropriate or impractical for a fish-only tank. That is not to say that if you have a fish- only tank that you should stop reading this article. Quite to the contrary, I hope that this article will provide some important information to everyone who owns a marine tank, regardless of what you chose to keep in it: fishes, corals, or other invertebrates. However, as I wrote this article, I quickly discovered that to do any justice to the subject was well beyond the scope of a single article, so I will try to cover the subject very briefly in a two part series. Just so that you know what to expect, my next installment of this column will be the conclusion of the article. So why am I taking the time at the beginning of this article to point out that feeding is not just about fish? Well, because there are entire groups of coral reef invertebrates that feed on things too small for a fish to even see, let alone capture and eat. Those animals are typically called “filter-feeders” and most feed on tiny plants and animals (called plankton) that spend their entire lives floating freely in the water column. If there are enough of these tiny plankton in the water, our aquarium water becomes “cloudy” and we usually do something to remove those particles and make the water clear and “clean” once again. It is, of course, important to maintain very high water quality for our animals, especially in a reef aquarium, but there are entire groups of coral reef animals (such as feather-duster worms, mussels, clams, tunicates, barnacles, etc.) that thrive on those same particles that we work so hard to filter out. Obviously, if we would like to keep any of those animals in our aquaria, we need to provide them with some food, or like a starving fish, they will not survive for long in the aquarium. With that in mind, I wanted to take the time in this article to discuss the full range of foods required to keep a thriving coral reef alive in nature, and discuss the options for providing some of those same foods to your aquarium at home. I want to emphasize right up front that not all tanks will benefit from all the food types that I will discuss in this article. Obviously, if you’re keeping a tank filled with only large predatory fishes (such as grouper, lion fishes, eels, or snapper, etc. ), adding plankton that are too small for your fish to even see will likely hurt more than it will help conditions in your tank. Conversely, if you’re keeping a miniature reef aquarium without any large fish in it, dropping large chunks of meaty food in your tank will almost certainly be a bad idea! You have to use a little common-sense here, and I leave it to you to take this information and determine what changes, if any, you should make to the way in which you are currently feeding your aquarium. OK, now that we’ve gotten that out of the way, let’s start to talk about food. There are two main issues when it comes to feeding any animal: 1) are the particles of the right size and taste that they will be eaten, and 2) is the food providing the proper nutritional value to keep your animal healthy? Obviously, if the food is too big or too small for your animal to eat, the actual nutritional value is not particularly important, because none of it can actually be eaten. On the other hand, even if it is eaten, and does not provide adequate nutrition, then your animals will not thrive either. So we have to address both considerations when it comes to feeding. You may be asking yourself, “How can food be too big? Fish can simply bite out chunks of the appropriate size to swallow, right?” While that is true of fish with powerful jaws, it is not true for feather-duster worms or clams that don’t have any jaws to bite into their food. For these types of animals, and in fact virtually all filter-feeders, if the food particles don’t come in the correct size to start with, they may as well be a piece of sand, because they cannot be eaten even if they have the perfect nutritional profile, and these animals will starve to death regardless of the amount of this kind of food. If on the other hand, we try to feed nothing but newly-hatched baby brine shrimp to an adult panther grouper, it will also be unable to feed properly, and will likely starve. Although we rarely think of size being a concern for proper feeding, it is critically important to most marine animals. I plan to go through a list of most of the easiest and/or most nutritious potential live foods available on the market right now in this article, but the order may seem a little random to you. Although I jump back and forth between very different types of foods at the beginning of the article, there is a reason for the order in which I have chosen to discuss each food type. The main reason is that each of the long sections that follow are probably the best example (food type) by which to introduce some important issues to you, before ending the article with a more traditional list of the pros and cons of each food. In any case, I will discuss the size and nutritional value of each food type in more detail below. Phytoplankton is a word made up of two basic roots “phyto” – pertaining to plants, and “plankton” – meaning basically “floaties in the ocean.” So, phytoplankton is just a technical word for tiny floating plants (such as diatoms and dinoflagellates) which serve the same role in the food chains of the oceans as grass and shrubs serve on land; namely small things eat them, which are in turn eaten by bigger things and so on down the line. 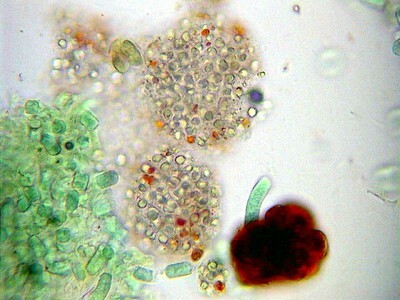 Many coral reef animals feed directly on phytoplankton. In fact, even those animals that do feed directly on phytoplankton still rely on the nutrition gained from these tiny plants: even the largest predators are, at some level, eating something that feeds on something else that feeds on phytoplankton or some other marine algae. These tiny floating plants (on the order of 2-20 micrometers, or roughly 8/1,000 – 8/10,000 of an inch) are the primary food for a variety of coral reef invertebrates (such as feather-duster worms, sea apples, mussels, and flame scallops to name a few). Despite the fact that there are many animals sold in most petshops that rely exclusively on phytoplankton to survive, these food items are probably the least common element included in feeding an aquarium. If you hope to keep any of these animals in your aquarium, you obviously need to provide them with food, and they simply cannot get by with left-overs from your fish, or traditional “invertebrate foods” based on pea- flour and yeast sold in most petshops. Like any other pet, feather-dusters, flame scallops or whatever need to be fed on the appropriate type of food to survive, and for these animals, the only appropriate type of food currently available is phytoplankton. In addition to being the primary food for many filter-feeders, phytoplankton also play an important role in the nutrition of many larger animals such as shrimps and fishes. However, these foods are far too small for shrimps or fishes to eat, so why are they so important? Well, a number of essential nutrients provided by marine algae in general, and phytoplankton in particular, cannot be synthesized by animals, and are therefore extremely important components of a healthy diet. All animals require some amount of certain polyunsaturated fatty acids in their diet, but in clinical trials two specific types of fatty acids are repeatedly indicated as being essential to animal health. These two general classes of essential fatty acids are Omega-3 and Omega-6 fatty acids, which are an essential component of cell membranes, and particularly important in the normal development of eye, nerve and heart tissue (I’ll come back to this in more detail below). The difference between these two classes is unimportant (the name denotes their chemical structure), but the fact that they are required for normal growth and development, as well as immune function, is an important thing to know (both for yourself and for your pets). Omega-6 fatty acids are primarily derived from animal sources, while Omega-3 fatty acids derive primarily from plants. Omega-6 fatty acids are generally fed far in excess of their need, because animal fats are commonly included in any commercially available food added to our tanks. Omega-3 fatty acids, on the other hand, are frequently lacking in the diets of both humans and our pets, and the ratio of the more abundant Omega-6 to Omega-3 fatty acids is typically 4 or 5 (and sometimes as high as 25) times what it would be in nature. Because fatty acids cannot be converted from one basic structure to the other, a proper balance of both classes of fatty acids is important to the health and proper development of all animals, although the exact nutritional requirements vary by species (and most are not known exactly for aquarium species). You may have heard about the long chain Omega-3 fatty acids in the news with regards to human and/or pet nutrition, but they play an equally important role in the nutrition of your fishes and coral reef invertebrates as they do for your dog, or for you. The two Omega-3 fatty acids of primary interest to fish breeders for the past 20 years have been the highly unsaturated fatty acids (HUFA for short) DHA (docosahaxaenoic acid: 22:6 n-3) & EPA (eicosapentaenoic acid: 20:5 n-3) which are synthesized almost exclusively by marine algae. 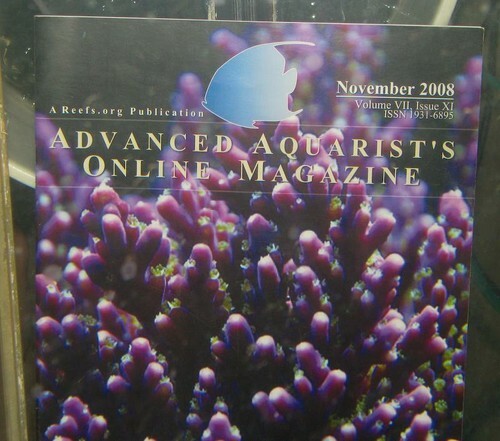 In fact, one of the major breakthroughs in the aquaculture of marine animals was the discovery that certain highly unsaturated fatty acids were an essential part of the diet, and without them, nutritional deficiencies or arrested development are common problems (reviewed by Watanabe et al. 1983). For example, newly hatched brine shrimp ( Artemia ) are a simple and easily cultured food for the larvae (juveniles) of many marine organisms, but because these shrimp typically lack sufficient quantities of EPA & DHA, most marine fish fed exclusively on baby brine begin to die off within a week or so after hatching (reviewed by Holt 2003). The widespread success of culturing and breeding many marine animals has come only since the discovery of the importance of including these essential fatty acids in the diet. DHA has been shown to be important in the normal growth and development of the central nervous system, and in particular the brain, eyes and reproductive organs, while EPA is important to cardiovascular health and plays an essential role in certain immune responses. Among the common symptoms of EPA/DHA deficiency in marine animals are1) Sudden fright syndrome – shock, convulsion or even death when the animals are frightened; 2) poor vision, and reduced ability to locate prey; 3) worn or mysteriously eroding fins; 4) poor growth rates or sudden massive die offs during early development; 5) low egg viability or infertility; 6) high mortality and disease rates, particularly when under stress (e.g., shipping or acclimation), and 7) inability to properly heal after being wounded (reviewed by Rainuzzo et al. 1997; Masuda et al. 1998; Fredalina et al. 1999; Furuita et al. 1999; Sargent et al. 1999; Ishizaki et al. 2001; Holt 2003). By “enriching” food items such as Artemia with phytoplankton prior to feeding them to the marine animals being raised, the amount of EPA & DHA is often increased to the point that die-offs and developmental problems previously encountered are completely avoided (reviewed by Rainuzzo et al. 1997; Sargent et al. 1999; Holt 2003). However, additional research has shown that it is not sufficient to simply add a lot of EPA & DHA to the diet of marine fish. Our understanding of the role of these essential fatty acids in the diet of marine fishes has evolved from trying to determine the optimal levels of EPA & DHA in the diet to consideration of the relative ratio of EPA & DHA as well as AA (arachidonic acid: 20:4 n-6) in the diet of marine animals (Sargent et al. 1999). Simply adding these fatty acids without consideration of the ratios provided in the diet of captive marine species may ultimately be more harmful than helpful. In a recent review by Sargent and colleagues (1999), they conclude that a mixed diet is required for the healthy maintenance of marine fish species. They concluded that the best diet for larval marine fish is one that contains roughly 10% of the dry weight as Omega-3 highly unsaturated fatty acids with less than 5% triacylglycerols. Any other mixture resulted in a nutritional imbalance that can, in some cases, be as serious as the absence of these essential fatty acids from the diet in the first place (reviewed by Rainuzzo et al. 1997; Kobayashi et al. 2000). So, even though your fish can’t possibly eat phytoplankton, hopefully I have managed to convince you that the nutrition provided by these tiny plants is ultimately important to the health of your fish as well as your filter-feeding invertebrates. Having said that, there are several ways in which to get the nutritional benefit of phytoplankton to your fishes. As I just mentioned, you could enrich live foods to some degree by feeding them on phytoplankton for a few hours before feeding them to your fish (e.g., McEvoy et al. 1998; Olsen et al. 2000; Sorgeloos et al. 2001). However, that is not nearly as simple with dead or frozen foods, and so the other option is to use a liquid HUFA supplement for adding to your food. There are several such products on the market (e.g., Selcon, Zoecon, etc. ), and you should be able to locate a number of these by flipping through the pages of any hobbyist magazine. Enrichment has been so successful that every commercial aquaculture outfit of which I am aware uses either phytoplankton or a liquid HUFA supplement as part of their regular feeding routine (reviewed by Rainuzzo et al. 1997; Sargent et al. 1999; Sorgeloos et al. 2001). It is much more intuitive to realize that nutritional value is a major concern for feeding our animals. One of the most common mistakes that people make with feeding large predatory fishes (such as groupers, snappers or lion fishes), is to give them feeder goldfish. There are many reasons that people usually give feeders to their marine fishes. First, virtually all of these predatory fishes are still wild-caught, and when first brought into captivity, they do not receive the proper cue to initiate feeding from flake or frozen foods, and the addition of a struggling live fish (such as a freshwater goldfish tossed into a marine tank) is a powerful feeding cue to get these fish to immediately attack the prey. That means that the owner doesn’t have to invest any time in training the lionfish to accept other foods. Second, because goldfish are so slow relative to most marine fishes, it is easy for the lionfish to catch. Third, the use of goldfish is a simpler and more cost effective way to feed these guys than to use a marine “feeder” fish. I think that all of these factors come into play with the decision of most pet shops to feed goldfish to their lionfish. Because a good feeding response is one of the criteria that most of us use to decide whether or not a fish is healthy and worthy of purchase, this is an important thing for any pet shop to be able to demonstrate to us as potential buyers. So, adding a feeder goldfish to a tank of lionfish is one of the best sales techniques available to a retailer. You have to admit, there are few feeding responses among marine aquarium fishes quite so dramatic as watching a lionfish hunt and then engulf a goldfish whole! Whether we are willing to admit it or not, deep down, most people get a thrill from watching a predator hunt down and devour live prey. In fact, I suspect that is a large part of the reason that many people decide to purchase a lionfish in the first place. I am not saying that there is anything wrong with the thrill of seeing a lionfish hunt. In fact, many zoos and public aquariums now realize that providing live prey to active and intelligent predators makes for a much healthier and happier animal. It seems that the thrill of the hunt extends to our pets as well, and without the challenge of hunting live prey (or some similar puzzle-solving challenge or enrichment) many zoos have found that their animals develop behavioral and/or health problems. However, the nutritional value of feeder goldfish for a marine predator is a much more serious concern. So, now let’s get into the discussion of why you should not use feeder goldfish for your lionfish (or any other marine predatory fish) – I’ll explain it in more detail below, but the short-and-sweet answer is that freshwater fish make a lousy food for marine predators. A buddy of mine is a fish parasitologist who used to volunteer with a couple of veterinarians at public aquaria to do autopsies on dead fish. He was telling me that the single most common cause of death he’s seen among marine fishes at public aquaria is “fatty liver disease.” Although not really a disease, fatty liver is a serious condition in which the liver becomes enlarged, often to the point that it interferes with, or even crushes, the other internal organs and is apparently the cause of death. This condition seems most commonly to be the result of poor diet, and the consensus of several well-known fish pathologists is that the single most common cause of fatty liver disease is a diet high in saturated fats, although biotin and/or choline deficiencies, toxemia and “unknown nonspecific causes” are also possible factors. My buddy said that he also sees the same fatty liver disorder in a variety of marine fishes (most commonly groupers and lionfishes) from pet shops and hobbyists who fed these predators on a diet of primarily live goldfish. Although bacterial diseases and parasitic infections claim many more fish than nutritional deficiencies(Francis-Floyd and Klinger 2003), fatty liver disease is probably one of the most common of fatal nutritional problems. Aside from the fatty liver “disease,” providing the wrong proportions of the various fats in the diets of marine fishes have been shown to result in reduced growth, lower percentages of muscle tissue, liver degeneration, higher susceptibility to bacterial and viral infection, and a decrease of hemoglobin in the blood cells among other nutritional problems. All of these things suggest there is a very real, and potentially fatal, consequence to feeding your favorite marine predator primarily (or only) on freshwater feeder fish (such as goldfish or guppies). Table 1: Total amount of various nutrients in a 100g sample of tissue from selected species of potential food fish as compiled by the US government (Dept of Agriculture) for nutritional comparisons of foods that are available to consumers. There are some obvious differences between species with freshwater, brackish and marine origins. For example, marine species tend to have less total energy per unit weight, but more protein and substantially less fat. Not surprisingly, brackish species tend to fall between the two extremes, although in most cases other than protein content, the brackish species tend to more closely resemble freshwater species in their nutritional makeup. The most striking and important difference between marine, freshwater and brackish species however, is the much lower fat content of marine foods. A closer look at the lipid profiles of these species groups gives a better picture of how the groups differ and where it is possible to artificially reduce that difference. Table 2: Amount of saturated fat and a number of essential highly unsaturated fatty acids (HUFA) for each of the species groups listed in Table 1. Values for Saturated fats, LA (Omega-6, linoleic acid – 18:2), ALA (Omega-3, alpha-linolenic acid – 18:3), EPA (Omega-3, eicosapentaenoic acid – 20:5), and DHA (Omega-3, docosahexaenoic acid – 22:6) are again measured in grams from a 100g tissue sample as presented in Table 1, above. These fatty acids are among those typically included in HUFA enrichment products to supplement the diet of marine fishes in captivity. Small, non-zero numbers are denoted by < 0.01. The lipid profiles between freshwater and marine species are very different, and the amount of saturated fat in the average freshwater prey fish is roughly 8 times that of the average marine fish. But, if we use catfish and carp as a reasonable proxy for feeder goldfish, then the picture is even worse, with a single feeding of goldfish providing more than 20 times the saturated fat as a feeding of the average marine prey fish. It is hard to imagine that incorporating 20 times more saturated fat into the diet of any animal (you or your fish) is not going to have a substantial effect on long-term health! Table 3 a & b: Averages of the nutrient values presented in Tables 1 & 2. If mixed species averages were available in the U.S. government (Dept of Agriculture) database, I have used them here. Where mixed species averages were not available, I tabulated the records for up to a dozen species (I stopped after 12 if there were more) in each category and calculated the average for each for presentation here. In stark contrast to the advice I have heard dispensed in several pet shops to supplement goldfish and/or guppies with Selcon or Zoecon (highly unsaturated fatty acid supplements) to make up for the fact that these animals come from different habitats, in this case such “enrichment” will only make the situation worse, not better! Supplementing the fat profile of a goldfish with HUFA would be roughly equivalent to making your BigMac more nutritious by dipping it into vegetable oil first. Sure, it’s better than dipping it into lard, but still not going to change the fact that you’re getting more fat in that single meal than you’re ideally supposed to eat in an entire day, and it only makes things worse than if you had not dipped the burger at all. . . . So obviously feeder goldfish are not the best choice of a staple food for your marine pets, but what about guppies or mollies? These are brackish fish that are frequently adapted to saltwater – do these provide better nutrition than feeder goldfish? The simple answer is “I don’t know.” My gut feeling is that because brackish-water fishes are somewhat intermediate, but are generally closer to the lipid profiles for freshwater than they are for saltwater species, guppies and mollies would likely be inordinately high in saturated fats as well. Probably closer to the roughly six times the amount of saturated fats found in the average brackish fish rather than the roughly twenty times as high likely to be found in goldfish, but still high nonetheless. Perhaps that makes these fish a better choice than goldfish for a live food item to be fed to your lionfish until it can be weaned onto frozen silversides or some other marine staple food. David Cripe of the Monterey Bay Aquarium tells me that he has used saltwater acclimated guppies as food for marine fishes that he has been rearing, but these are usually fed for only a short period of time until the larvae are switched onto other foods. It seems unlikely to me that the occasional feeding of saltwater acclimated guppies or mollies will prove to be a problem for marine predatory fish, but as I said earlier, this is just my gut feeling, and I am really just guessing here because there are no fatty acid profiles available for any of the aquarium species we’re discussing here. However, given the data above it seems that ghost shrimp or even freshwater crayfish would be the best choice to feed your lionfish (or whatever) until you can train it to take frozen marine prey fish. The reason I say that is because the nutritional profile is not nearly so different between freshwater and marine crustaceans, and in fact, in this case, the freshwater animals are simply deficient in the amount of fats provided. This is good news for aquarists because it means that by simply supplementing a diet of crayfish or ghost shrimp with an occasional boost of some HUFA enrichment product (either by gut-loading, soaking or injecting the “feeder” animals), you’re likely to provide a perfectly suitable diet for long-term care of a marine predator such as a lionfish or grouper. This is easy an inexpensive to do, and once your fish is eating well on these prey, you can slowly start trying to hand feed it. Start off by hold the live shrimp in your fingers and let the fish come close to them before letting the shrimp go. After a few times, the fish will usually recognize that your fingers in the tank means food, and start coming to investigate them as soon as you put them into the tank. Start to hold onto the shrimp longer and longer until the fish starts to come and take the live food from your fingers before you let it go. Once your lionfish will take live ghost shrimp from your fingers, then you can try some recently dead ones, and then eventually move on to frozen shrimp. It takes some time, effort and patience, but I have yet to find a fish that I could not train in this way, if you invest the effort. Although rotifers and ciliate protozoans are a small and generally uninteresting group to almost everyone else, they are quite well known among marine aquarists as the food of choice for breeding most saltwater fishes and many invertebrates. These nearly microscopic to microscopic little critters make a living in a wide variety of ways, ranging from filter-feeders to predatory species that feed on other rotifers and/or ciliates. Many of the most popular reef fishes (including most of the butterflies, angels and wrasses, to name a few) spawn tiny pelagic eggs that hatch into small larvae with mouths too small to eat anything larger than a ciliate. Studies on the natural diets of fish larvae reveal that they are composed largely of micro- zooplankton including protozoans (primarily tintinids, ciliates & foraminiferans), dinoflagellates, larvae of barnacles and molluscs, and copepod eggs and nauplii (Holt 2003). 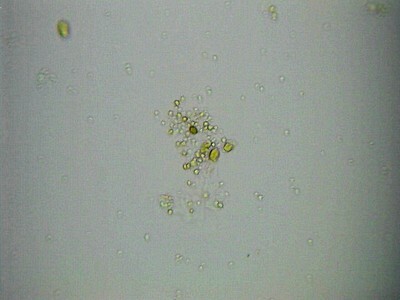 Planktonic diatoms are also eaten, and usually account for about 5% of the total content of larval fish guts (Holt 2003). The guts of wild-collected fish larvae contain a variety of these micro-plankton, with prey items ranging between 3 and 100 μm in length, with the vast majority of the gut contents being less than 60 μm (Holt 2003). Thus, the larvae of tropical marine fishes are simply too small to eat even tiny newly hatched brine shrimp (~5 times bigger than the largest prey found in the guts of wild-collected fish larvae), and smaller sources of food (such as rotifers and ciliates) are necessary if you hope to feed the early stages of most marine ornamental fish species. The tiny size and enormous reproductive potential of rotifers (and to a lesser extent ciliates) makes them a popular choice as a food item among breeders of marine fishes and invertebrates. 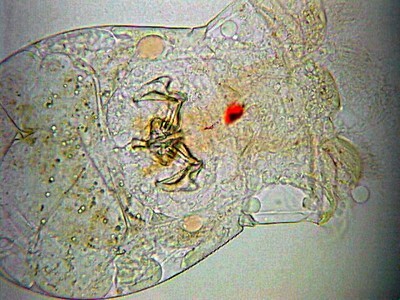 For example, under ideal conditions, a single female rotifer typically produces an average of 6 daughters per day and each of those grow to maturity and begin to produce their own offspring (the most commonly used of these animals are parthenogenic, and females produce daughters asexually without the need for their eggs to be fertilized) within 24 hours. At that rate, a single rotifer can give rise to approximately 134,455 offspring in only 7 days! Obviously, it does not take many rotifers to start and maintain a viable culture from which to feed your aquarium or larval culture project. The tiny size of rotifers, together with the relative ease with which they are cultured, and the very high reproductive rate together make these animals a popular choice for feeding many tiny and obligately suspension-feeding marine animals. Although these tiny creatures are easy to raise and of the correct size for many marine fish larvae, sadly, they are not particularly nutritious. In fact, it is only by stuffing them full of nutritious food that they themselves make a reasonable food for juvenile fishes and suspension-feeding marine invertebrates. I think that Martin Moe(Moe) has one of the best analogies for this that I have seen: rotifers are the equivalent of a grocery bag, you could swallow it, but if it is empty, it is not very nutritious at all. If rotifers are cultured on pea-flour and yeast-based meals, they may well grow, but they do not provide much nutrition to juvenile fishes. In fact, in most cases larvae of coral reef fishes fed exclusively on plain rotifers (ones that are not enriched with phytoplankton or a commercial HUFA supplement) fail to complete their larval stage (e.g., Moe 1997; Wilkerson 2001; reviewed by Holt 2003). Rotifers raised on an insufficient diet would be the human equivalent of filling that grocery bag with potato chips, soda and candies: it could well be very tasty, but it would not be very nutritious, and if it were the only food available to you, you would not remain healthy for long. On the other hand, rotifers cultured on phytoplankton and enriched with a highly- unsaturated fatty acid (HUFA) supplement (which I discussed at length above) are potentially very nutritious. In order to make this analogy a little more real for you, researchers showed that Pacific threadfin larvae raised on enriched rotifer diets had significantly higher survival in response to various stressors than siblings reared on unenriched rotifers (Tamaru et al. 1998). 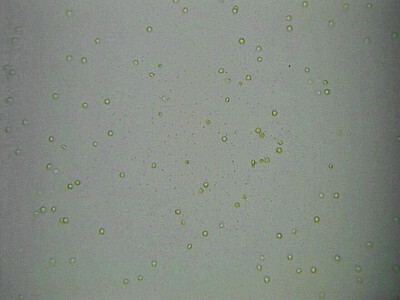 However, just to make things more complicated, it turns out that you cannot simply dump in a bunch of rotifers to a tank and call it fed: it has been long known that the actual ratio of fish larvae to their prey in a tank makes a huge difference to the survival and growth rate of the animals (e.g., Houde 1977; reviewed by Tamaru et al. 2003). For example, researchers found that fish larvae strike at prey in the approximate rate of encounter early in development, but begin to actively hunt for food as they continue to develop. Although it appears counter-intuitive, it turns out that growth and survival can be equally reduced by a lack of food OR an over-abundance of food! The experiments revealed that the highest survival and growth of fish larvae was obtained by maintaining an approximate ratio of 10 rotifers per milliliter for densities between 25 and 50 fish larvae per liter (Tamaru et al. 1991). Although this may sound like a bunch of hot air to some readers, aquaculture facilities and home fish breeders discovered many years ago that rotifers can grow well on a whole suite of foods (ranging from phytoplankton to pea-flour and yeast based “invertebrate foods” and even V-8 juice! ), but despite the fact that you have a lot of rotifers in culture, they perform poorly when fed to juvenile fishes (in terms of growth and/or survival of the larvae). Many articles in various hobbyist magazines have reported successful spawning of marine fishes over the years, but until the past 5 years or so, the majority of them also reported a sudden massive loss of the larval fish within a week or so of when they first start to feed (e.g., Moe 1997; Wilkerson 2001; reviewed by Holt 2003). To date, the single biggest hurdle to rearing the larvae of marine fishes in captivity remains first-feeding, the period during which fish larvae switch over from internal yolk stores to capturing planktonic prey (reviewed by Holt 2003). As I explained above, unenriched rotifers may be accepted by some fish larvae, but even well-fed larvae show reduced growth and survival rates relative to sibling larvae fed on properly enriched rotifers (Tamaru et al. 1998). The method of enrichment most common in the hobby is probably enrichment with Selcon or Zoecon. However, researchers found that survival of rotifers in culture medium enriched with this concentrated lipid emulsion was very low: after 24 hours of enrichment, the number of live rotifers in culture dropped from an average of 2000/ml to 400/ml (Tamaru et al. 2003). In contrast, rotifers enriched with a concentrated algae paste (Reed Mariculture Instant Algae) remained at ~2000/ml throughout the enrichment process. So, although these concentrated HUFA products work superbly for enriching food items for larger fishes, they do not seem to be particularly suitable for enriching live rotifers. Obviously the method of enrichment also plays an important role in the availability of suitable food for the larvae of marine fishes. Overall, rotifers enriched with phytoplankton and HUFA appear to provide a suitable food for the juveniles of a number of marine fish species, and a number of species were first cultured successfully when fed on enriched plankton such as rotifers (reviewed by Watanabe et al. 1983). OK, so that is probably more information than most people would like to know about any of these particular food sources, so I will stop here for this column. Next time I will continue the discussion with brine shrimp, tubifex & black worms, freshwater crustaceans, mosquito larvae, and macroalgae, nori & leafy vegetables.